Step One: Gather some information. Write down as many personal notes about the deceased as possible. Look at photos, clippings. Flipping through photo albums may remind you of important qualities and memories of the person who died. Answer a few questions: What made your loved one truly happy? What inspired you to write this eulogy? What were your loved one's passions? What will you remember most about this person? Keep in mind that a eulogy is not a biography but more your personal thoughts and remembrances from your point of view. You may want to ask co-workers, friends and others for their stories and memories. You should see some repetition in your notes and this will lead to the main theme. III. A conclusion to summarize your thoughts and restate your theme. Step Three: Work first on the middle section (Part II). Once you have this part the beginning and summary will be easy. Develop the outline by grouping similar themes from your notes from Step 1. For example, you might want to gather all the achievements together. Merge the comments about the deceased individual's philosophy of life. Step Four: Organize the conclusion (Part III). A conclusion reminds the listeners of the theme and imprints the strong feeling you have about the loss. The key is to conclude effectively and quickly. "We will all miss Jackie's sense of humor, her talent for knowing what is really important in life and her famous chocolate chip cookies" (a little humor doesn't hurt as long as it's not offensive to anyone). "Her example lives as an inspiration for all of us to follow." Step Five: Write the beginning of the eulogy (Part 1). This usually starts with an attention getter. It will set the theme and can be in the form of a short story, a poem, a saying, lyrics to a song. It will introduce the goal and theme you used when you began the process. Step Six: Polish it up. Your best bet is to walk away from it for a few hours or overnight if possible. Work on it so it sounds like a conversation. You want to talk to the audience as naturally as possible. 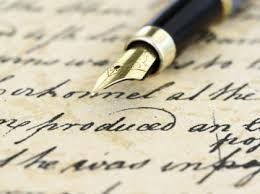 # Keep it short, 4-8 minutes long, 3-7 typed pages. # Type it out using 14 pt type so it's easy to read. # Practice the eulogy aloud and time yourself. # Read it to friends and family and get their feedback. Edit where necessary. # Keep the content in good taste and keep it positive. While normally speakers do not read word-for-word, because you are more than likely going to be emotional, don't be afraid to read word for word. This way you won't leave out any key points you or others wanted said. Speak as naturally as you can just as if you were telling someone about your loved one. Speak up. It's very important that you speak clearly and loudly so that everyone can hear you. Keep the written eulogy as a memento. You can add it to your memento chest and share it with others who may want a copy. By following these steps, writing and delivering a eulogy will become less stressful and more of a healing process.